School Bike Parking Solutions Encourage Biking to School with Convenient, Safe, and Secure Bike Storage. More and more school districts are adopting Safe Routes to School and other programs to promote walking and biking, with improving bike parking a key component when planning their programs. Providing convenient, safe, secure, bike parking for both students and teachers encourages bicycling to and from school, promoting healthier lifestyle benefits for riders, reducing traffic congestion and supporting clean air initiatives. Focusing on well-design bike parking areas with high visibility for student convenience and bike security, safe placement away from vehicle traffic, and aesthetically pleasing bike parking furnishings to compliment building design and campus landscapes are essential. Consideration for bicyclists needs, for example, ease of use without lifting bikes for younger elementary school students or high capacity solutions for large high school campuses, are important factors in choosing the most appropriate bike parking furnishings for schools. CycleSafe space-saving designs and attractive, cost-efficient furnishings including Bike Lockers, Bike Racks, Bike Shelters and more. We work school district administrators, architects, contractors and facilities managers to optimize bike parking and storage for K-12 schools. CycleSafe outdoor bike racks provide bike parking security, stability, and safety with Class II short-term parking for schools. We offer a wide range of bike rack options to compliment school campus landscapes and meet cyclists’ convenience and security needs. We select product materials for long lasting durability, designed for use over decades, not years, including leading edge coating technology for maximum corrosion and impact resistance, and protection of bike finishes. CycleSafe Bicycle Lockers provide the highest security bike storage for schools with protection from theft, vandalism, and weather. These durable, virtually indestructible bike lockers are compression molded with modern structural-grade composite materials which are non-corrosive, rust free, impact resistant, and with a graffiti/UV resistant polyurethane enamel paint finish. Install them on your school campuses campus for the proven, lowest cost of ownership over long-term use. CycleSafe bike lockers can be combined with school bike shelters to provide varied levels of security and protection that serves the varying needs of students, teachers, and administrators. Bike shelters are often a great option for schools because they can offer a mix of lower cost short-term bike parking solutions with protection from the elements. Bike shelters combine with our bicycle racks to meet on-demand, Class 2 bicycle parking for four to ten bikes per unit with covered protection. Compression-molded tops are contoured for runoff and support frames consist of heavy gauge steel tubing protected with polyester powder coat finishes. Add plexiglass, wire mesh, or perforated metal side panels for additional protection from the elements. School bike corrals can be designed to use existing automobile parking spaces and sidewalk areas. Bike corrals transform standard parking lanes or sidewalk areas into bike parking for 4-8 bikes per five-foot section. Bikes can be placed at 45-degree angles to increase pathways between pedestrian or traffic lanes. 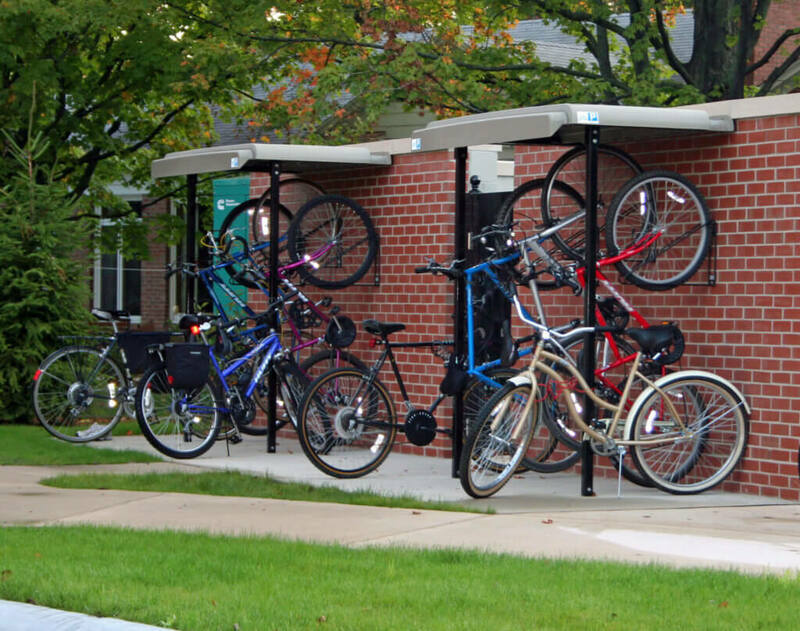 Our bike corrals include bike racks and bike stall options with in-ground, surface, and rail mount installations.